Made by New South Wales Government Printing Office in Ultimo, Sydney, New South Wales, Australia, 1956. The railway ticket was issued for the first journey of the first train from Strathfield station on the day of the opening of Sydney’s Circular Quay railway station on 22 September 1956. It is are numbered “0000” which indicates that it was the first ticket or test ticket issued at Strathfield station for a journey via Circular Quay on the Sydney rail system. 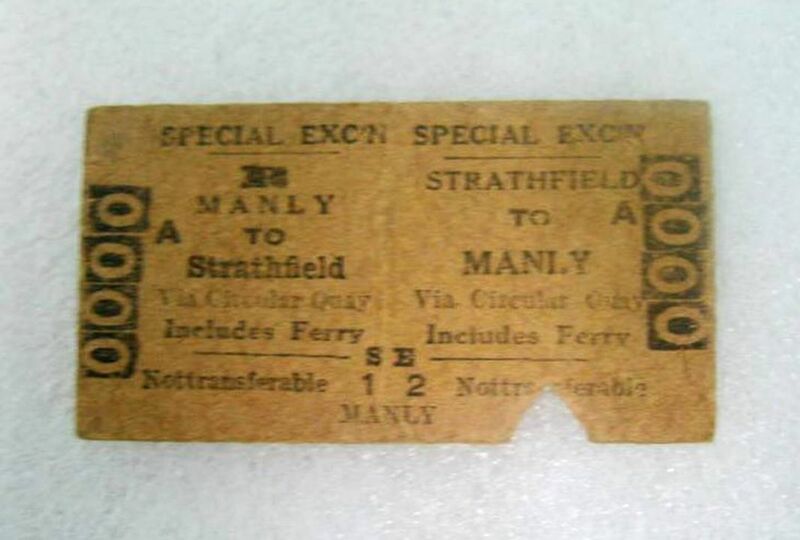 A used combined special excursion railway and ferry ticket with text printed in black ink on brown pasteboard for travel Manly to Strathfield return. The following text is printed on the front left hand side; 'SPECIAL EXC'N / MANLY / A TO / Strathfield / Via Circular Quay / Includes Ferry / Not transferable / SE / 1 2 / MANLY' and on the front right hand side; 'SPECIAL EXC'N / STRATHFIELD / TO A / MANLY / Via Circular Quay / Includes Ferry / Not transferable'. The ticket is numbered on front left and right sides with '0000' and has a small triangular shaped section missing from the bottom right hand side indicating a ticket inspector or ticket collector has clipped it. Stamped on reverse and issue details printed on reverse. The ticket is date stamped on the reverse right and left sides in black ink with '22JA 6A'. The following text is printed on the reverse left hand side; 'Issued subject to the By-laws / and Regulations of the Comm- / issioner for Railways and the / Port Jackson and Manly Steam / Ship Company Ltd / Available for One Journey only / on date Stamped on ticket. B88'. The following text is printed on the reverse right hand side; 'Tickets issued on Friday Satur- / day or Sunday, are available for / Return until Monday following / date stamped thereon, and when / Monday is a public holiday or / when issued on other occasions / will be available when advertised. / Available for One Journey only. Journey cannot be broken'. The design of this type of ticket, known as an Edmondson, goes back to the beginning of the railway age in England in the 1830s. A clerk named Thomas Edmondson invented a ticket printing and numbering machine, which pioneered a system of fare collection subsequently used by railways around the world for over 150 years. Thomas Edmondson (1792-1851) was born at Stonewell, Lancaster, England, on 30 June 1792. He was originally a journeyman cabinet-maker for the Lancaster furniture manufacturer, Robert Gillow & Company where he improved cabinet-making tools and invented a device to churn butter while rocking a cradle. Edmondson left the firm and began his own cabinet-making business in Carlisle with a fellow Quaker. However, the firm went bankrupt in 1836 and at the age of forty-four Edmondson began work as a stationmaster at Milton (now Brampton) on the Newcastle and Carlisle Railway. It was said that he found the task of handwriting the individual journey details on the tickets irksome and a delay for customers. He also worried that using such a system was open to fraud. He was particularly concerned that there was a lack of revenue control over the ticket sales with no satisfactory way to check that money collected by the stationmaster reached the company's office. Edmondson subsequently devised the design of the tickets being small pieces of cardboard or pasteboard 3 cm by 5.75 cm. His tickets were initially handwritten but later, using his woodworking skills, he made a simple ticket-printing frame and designed a wooden press for dating them through an inked window. These he numbered by hand and placed in a vertical tube for each destination, with a counterweight device to push up the next ticket when one was issued. Edmondson also invented a foot-operated date-stamping press, the early version of which was dreaded by ticket staff as it could crush the fingers. However, Edmondson's most significant contribution was a machine that printed tickets in batches complete with the serial numbers to enable all sold and unsold tickets to be accounted for. Edmondson's tickets met the three basic needs for revenue control in that firstly they provided a receipt for the passenger's money. Secondly, they authorised the passenger to travel a certain distance by a specified route and in a particular class, and thirdly they ensured the company received its full dues. Each ticket was serially numbered so that the clerk had to account for either the cash or the unused tickets. Apparently the Newcastle and Carlisle Railway showed little interest in Edmondson's inventions so he transferred to the Manchester and Leeds Railway and became their chief booking clerk at Manchester. He introduced his ticket system over the entire line when it opened in 1839. To enable illiterate railway staff to check tickets he printed different patterns on the reverse side. (Manchester had wavy lines). Two years later Edmondson left the Manchester and Leeds Railway to establish a ticket a business to make tickets and machines, which traded under the name of his son, John B. Edmondson, in Manchester. The Railway Clearing House, an organisation of various British railway companies established in 1842 to allow passengers and goods to easily travel between locations, adopted the Edmondson ticket system. It became a virtual condition of membership that Edmondson tickets were employed by railway companies and so spread its adoption widely. Participating railways paid Edmondson a royalty of 10 shillings per route mile for using his pasteboard tickets. Most standardised the colours for different classes, finally using white for first class ordinary and green for third. Edmondson's original timber dating presses were developed into metal ones and mass-produced by John Blaylock, a clockmaker of Carlisle. At this time an automatically fed ticket-printing machine was also produced. Edmondson also collaborated with William Carson of Scotland to make a printing and dating press, which was later refined by Carson. Edmondson's machines and their improved successors quickly became the standard for British railways and in many other countries. By 1843 twenty-seven English companies and the Paris and Rouen railway were using his system. In New South Wales the Edmondson tickets first appeared shortly after the Parramatta Junction (now Granville) to Liverpool railway extensions opened in 1856. The Edmondson system provided a tight check on revenue collection and passenger travel. It was used in New South Wales for some 150 years prior to the gradual introduction of machine-printed tickets from 1989. The main drawback of the Edmondson system required each station booking office to hold huge stocks of pre-printed tickets in racks to every destination regularly used, multiplied by each of the many types of fare, single, day return, period return, excursion, dog, cycle etc. The serial numbers had to be recorded meticulously in a ticket ledger and each clerk's sales accounted for accurately. To cater for bookings of infrequently used journeys or routes, every station was provided with blank cards or paper tickets. Pasteboard railway tickets have generically been known as Edmondson tickets even though companies such as Waterlow & Sons of London also made printing and number machines and later electric printing machines. In Australia, government railways and the Emu Bay Railway used a mixture of Edmondson and Waterlow machines for ticket printing. The railway tickets were printed at the New South Wales Government Printing Office in Ultimo in Sydney. Initially ticket production was under the control of the Commissioner for Railways. In the late 1850s James Ball was appointed the Government Ticket Printer in New South Wales and tickets were originally printed on thin paper with butts. It was not long before Edmondson's patent railway ticket machines were used by the New South Wales Government Railways to print tickets. This task was taken over by the Government Printer in 1867, which eventually established its operations at Ultimo in 1880. By the late nineteenth century, the railway ticket printing staff at the Government Printing Office comprised a foreman, four printers, three apprentices, a ticket entry clerk and a ticket despatch clerk. Each quarter the English firm of Thomas De La Rue & Co. supplied a range of blank tickets in fifty to sixty colours ready for printing. The machinery in the ticket printing section comprise five special printing machines, three counters, three typing up machines and one dater. By the 1950s the Government Printing Office was producing 68 million rail tickets annually. Almost every form of ticket was produced at the Government Printing office including bus, tram, and betting tickets, motor labels, and schoolbooks as well as electoral lists, Hansard and the Government Gazette. However, the Railways apparently accounted for the largest percentage of the Government Printer's work. The railway ticket was the first issued on the first day of operation of the Circular Quay railway station on Sunday 22 January 1956. The opening of this station saw the completion of the last section of the City Railway, a combination of underground and part elevated rail link between St James and Wynyard stations via Circular Quay. The official opening had taken place two days earlier, on Friday 20 January, in drizzling rain conducted by the then New South Wales Premier Cahill. The single deck electric train used for the opening ceremony was the first to be equipped with power-operated doors on the suburban system. A city railway was first considered almost 60 years earlier in the 1890s when discussions for an extension of the railway from the inconvenient terminal at Devonshire Street to the city began. Several schemes for a city railway were proposed including one for a surface steam railway to Circular Quay and another for a huge terminal in Hyde Park. The plan ultimate adopted was that of Dr J.C.C. Bradfield who proposed and designed an elaborate electric system to serve the city and its suburbs. Bradfield's scheme included the an underground city circle electric rail, a bridge over Sydney Harbour to bring the North shore trains into the city as well as well as lines to Cronulla, East Hills, Bankstown and Cabramatta via Regents Park. However, changes were made in the original concept and much of Bradfield's proposal was never completed. Plans discarded or "postponed" included the railway from North Sydney to the Northern Beaches, St Leonards to Epping, Central to Matraville and Town Hall to Gladesville. The construction of the City Railway began when the New South Wales Parliament authorised its construction in 1915. The eastern Central to St James section was opened to the public on 20 December 1926 and the western Central to Wynyard section in 1932. The final Wynyard to St James section costing over £4 million, had been started in 1936, halted temporarily in 1937 and stopped during the Second World War in 1941. It was reopened in 1945, closed in 1951 from lack of funds, reopened and closed again in 1951 and restarted in 1953. Between 1933 and 1934 the tunnel between St James and Circular Quay had been used for an experimental mushroom growing by Raymond Mas, producing up to 10,000 pounds of mushrooms a year. During the Second World War the tunnel was used for wartime operations and apparently contained fighter command offices, Army signallers, search light personnel and the RAAF anti aircraft headquarters. Bomb shelters for the general public were located in the vacant tunnels for the Eastern Suburbs Railway under Hyde Park. It was not until 1953 that tunnelling began again but could not proceed under Circular Quay because of the inundation of water into the tunnels. So an elevated structure for the railway cross to the harbour foreshore with a station for access was proposed and built. From its inception it has horrified many of Sydney's architects and citizens by it ugliness, the criticisms of which have endure for decades. Nevertheless, completion of the Circular Quay sections of the City Railway in 1956 greatly improved travelling conditions and times within the city and between the city and suburbs in the electrified area. In its first week of operation train travellers purchased 44,000 tickets at Circular Quay station. This was two thirds of the tickets issued each week at busy Wynyard station. The opening of the Circular loop enabled trains, which had formerly terminated at the Wynyard low-level platform, to continue via the loop and to St James and the Illawarra lines. In the same way trains from East Hills and the Illawarra suburbs, which had formerly terminating at St James, continued on via Circular Quay and Wynyard low level to the Western Suburbs. The donor, Mr Philip Beer, who travelled on the first train of the Circular Quay service on Sunday 22 January 1956, purchased this railway ticket at Strathfield railway station. He said the train was very crowded and that passengers were permitted to keep their tickets on the first day of operation as a souvenir. The importance of this ticket is that it was the first ticket from the stock of blanks issued to Strathfield station ticket office with the serial number "0000". Upon purchase the ticket was stamped with the date.